Walk the path to trauma resolution — Step by Step. In addition to improved practice outcomes, effective integration of EMDR can lead to the long-term trauma resolution that your clients so desperately desire. Here is your invitation to transform your practice . . . and your clients' lives. EMDR Step-by-Step is a comprehensive course with Linda Curran (recognized trauma specialist, veteran clinician, sought-after national trainer and best-selling author on trauma) that will provide you with practical strategies for effective implementation of EMDR into your practice. You'll see HOW to turn theory into practice. Linda's training focuses on the development of clinical assessment skills with regard to client safety and stabilization — specifically for therapists who want to process traumatic material using EMDR, the groundbreaking treatment method used by leading innovators such as Bessel van der Kolk and more. Through in-session demonstration, instructive commentary, and expert guidance and support, you'll learn to safely and effectively utilize EMDR for traumatic stress treatment. Imagine the relief your clients will experience with this effective, break-through treatment. Imagine the satisfaction you will feel knowing that your clients' transformations stem from effective EMDR training, skill development, and practice. Imagine the confidence you will have when treating even your most challenging clients.
. . . and this EMDR course is your first step. Today Only $289.99 — An Unbelievable Value! Earn up to 8.25 CE Hours — included in the course tuition! Linda Curran, BCPC, LPC, CACD, CCDPD, has interviewed the world's leaders in trauma, including Bessel van der Kolk, M.D. ; Peter Levine, Ph.D.; Babette Rothschild, MSW, LCS; Stephen Porges, Ph.D.; Janina Fisher, Ph.D.; and many more, to discuss how EMDR can be effectively used with your trauma clients. In this module, Linda will help you develop skills for client safety and stabilization, ensuring your clients have the support and skills necessary for EMDR. Through in-session demonstrations, you'll see how to guide clients imaginal resource development. Understand the differences between the original 8-phase EMDR protocol, and the clinically-based modified EMDR protocol. Linda will provide insight on the necessity for clinical modifications when using the standard protocol's "script". With an understanding of the four essential elements of EMDR modified protocol, you'll learn how to modify intelligently. See the modified protocol in action again, along with a client demonstration using the future template. This is an imminently practical workbook that shows a variety of invaluable techniques to get centered, calm and organized. An effective and enjoyable guide to help you feel in charge of yourself. - Bessel A. van der Kolk, M.D. — Robert C. Scaer, M.D. It should be in every clinician's office — and in easy reach. — Peter A. Levine, Ph.D.
CE Video: Mistakes Made, Lessons Learned with Bessel van der Kolk, Janina Fisher, Peter Levine, and many more. Join the world's preeminent trauma experts as they share not only their knowledge and clinical acumen, but their most regrettable (and remarkably similar) clinical mistakes. Enjoy access to all course videos and materials online forever, and you can download the videos and materials to your personal library. Plus, use the CE21 Mobile™ app to access the course content on-the-go, wherever and whenever you want on your mobile devices. 2 Best-Selling Workbooks in PDF Format — Packed with hundreds of reproducible worksheets! Linda Curran, BCPC, LPC, CACD, CCDPD, is president of Integrative Trauma Treatment, LLC, in Havertown, PA. Currently, she provides clients an integrative approach to trauma, and treats PTSD in adolescent and adult populations, including clients with eating disorders, sexual trauma, and self-injury. An international speaker on the treatment of trauma, Linda has developed, produced, and presents multi-media workshops on all aspects of psychological trauma. She has trained thousands of mental health clinicians on trauma treatment across the country. Linda combines her knowledge and experience to guide you step-by-step as you learn and integrate EMDR therapy into your practice for effective treatment outcomes. For Linda's full bio, click here. Excellent Course – professionally presented and most interesting. Thank you so much! I thought this training was great, and just what I needed to get motivated to pursue competency in and use EMDR. What an outstanding presentation! Very comprehensive, clear and practical, Thank you so much for the professionalism. I sure appreciate having the experts on trauma added to your course, I look forward to more PESI courses of such high quality. 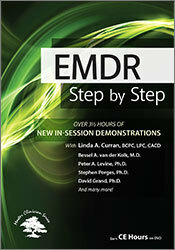 ...Curran made learning EMDR very easy and user friendly. She is genuinely concerned with maximizing the learning experience and is very willing to freely share her knowledge. I now have a clear and effective way to help my clients. I highly recommend this course and can say that you will have a wonderful experience with a very committed and skilled clinician. Well worth your time. [Curran's] EMDR training is second to none. She is an excellent presenter with a presentation that can only be an asset to your practice and to your patients. who will be experiencing this training alongside you. You'll be part of a community of hundreds of practitioners all focused on these EMDR materials, providing valuable opportunities to share insight and experiences. Q: I'm a beginner to EMDR, can I take this course? A: Yes! 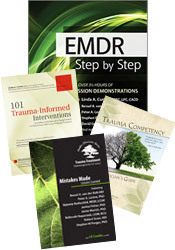 We've included some bonus materials to help the beginner gain a better understanding of "EMDR 101" before diving right in to course material. Although this course is geared towards people who've already had some EMDR training, a beginner will still benefit from the content provided. Q: Will I be able to use EMDR after completing this course? Will I need additional training? Does this course take the place of Level I and/or Level II training? A: It is VERY important to note that, while EMDR is a relatively easy skill to learn, processing traumatic memories is very difficult and requires a skilled therapist. If this is your first EMDR training, you will want to take additional training, including supervised in-person practice sessions, before implementing it into your practice. This course is not affiliated with the EMDR Institute or EMDRIA. Q: Will this course certify me to use EMDR with my clients? Is certification required for me to use EMDR? A: This course will not certify you to use EMDR. Certification is offered by the member organization EMDRIA; it is completely voluntary. Q: Will I get CE credit with this course? How much? A: Yes! This course qualifies for 8+ self-study CE hours if you complete all the course material and bonus material. Register now for instant access to the online conference portal — watch your email for login details to arrive within 15 minutes. Login to begin viewing all videos at your own pace. Download the videos and PDF workbook to keep forever. Start interacting with hundreds of online attendees via chat message boards. Complete your CE tests online when it's convenient for you, to earn 8+ CE hours.